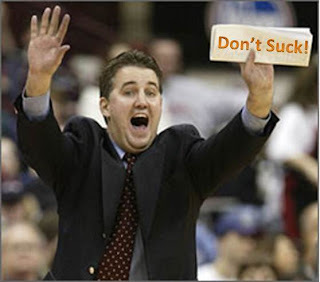 Kirk has become an internet star and has amazingly secured a guest post at Purdue blogging legend, Boiled Sports! 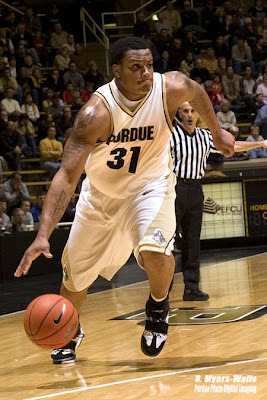 The guys over there were forced to gracious enough to be the exclusive host to Part 3 of the "Where Are They Now" series, and if you thought the Nate Minnoy edition was riveting, you won't want to miss Korey Spates' wild ride after his stint at Purdue! 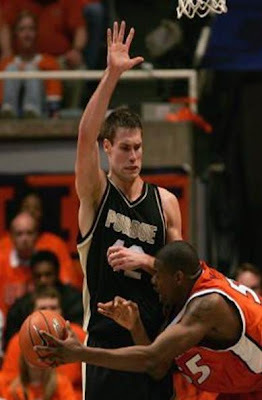 So head on over to Boiled Sports for Part 3 of the "Where Are They Now - Worst Year Ever" series, then head back over here as we entertain you all summer long at the worst-named Purdue blog on the web! Quick! 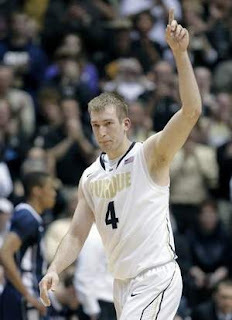 Name the last four Purdue players to average 10 points or more in their Freshman year. Amazingly, Purdue’s recent rise back into the national spotlight that began in the Fall of 2006 has only produced 2 double-digit scoring freshmen. You would have to go all the way back to that awful 2005-2006 season to find the other 2 players (read on to find out who they are!). With 2 freshmen among the top scorers, one would think that the stretch of NCAA Tournament runs began with this high-scoring Freshman class. 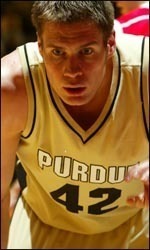 Instead, neither player would be seen in a Purdue uniform again. Nate Minnoy was one of the highest ranked recruits to come Purdue in the past decade, and his bright future was never more evident than when he dropped 25 points in a 82-75 win over Wofford in his and Matt Painter’s Purdue debuts (Bonus for clicking on the link: check out the scoreboard at the top of the page as Number 5 Michigan State lost to Hawaii by 22 points that day! Needless to say, the national press was not talking much about Purdue’s opener that night). Minnoy would never score more than 15 points in a Purdue uniform again, but was averaging a respectable 10.2 points per game as he faced Northwestern in his Big Ten debut. 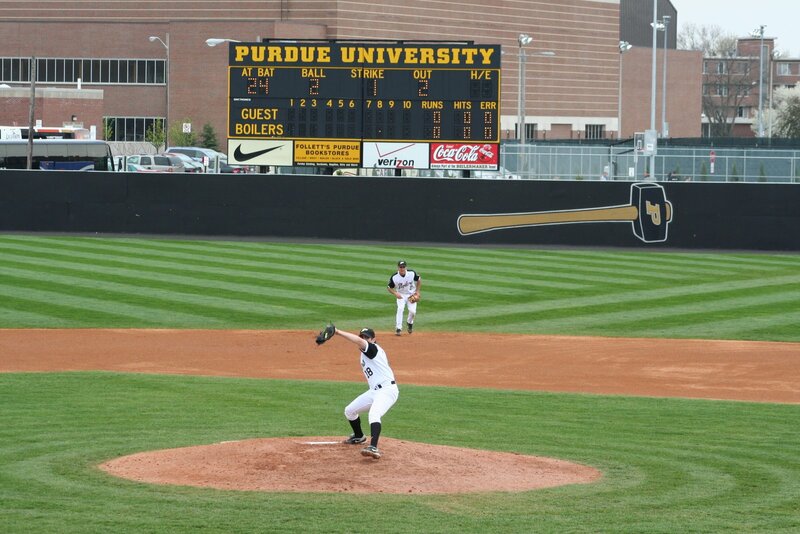 Playing in front of friends and family (he graduated from Hales Franciscan High School in Chicago), Nate tore his MCL and became the fourth Boilermaker starter to be out for the season. Still, hopes were high for the freshman’s career, as a possible 2006-2007 starting lineup of David Teague, Carl Landry, Terrance Crump, Nate Minnoy, and Marcus White was going to be a tough team to face with a full recovery from Minnoy. Unfortunately, Nate had some other issues, as can be seen in this MTV Nike Battlegrounds video from 2005, in which Tim Hardaway and Lebron James (!) both mention how Minnoy’s ego might lead to his downfall. Nike Battlegrounds - The Nate Minnoy story from Jim Helton on Vimeo. 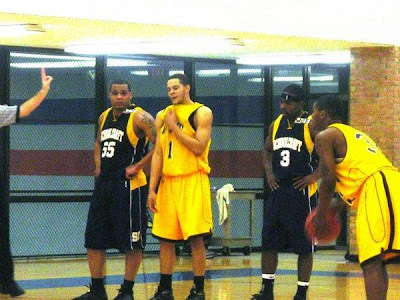 2006-2007 Season: Nate becomes eligible to play for the Ocelots in January, and leads the Ocelots with 22 points and 11 rebounds per game. Schoolcraft goes 14-6 after Minnoy joins the team, but loses to the eventual NJCAA National Champion, Mott Community College, 3 times in those 20 games (oops, meant this link). March 2007: Minnoy transfers to Central Michigan. 2007-2008 Season: Minnoy averages 8.8 points per game for the Chippewas, but his minutes diminish as the season wears on, and we know from the video above how Minnoy gets when his minutes are diminished! Nate was suspended prior to the MAC tournament for disciplinary reasons and he would never play another Division 1 basketball game. June 2008: Minnoy transfers to Lee University, an NAIA school in Cleveland, TN. 2008-2009 Season: Nate averages 8.9 points and 5.5 rebounds in 17 games for the Flames. Nate can’t make it through THAT season either, as he left the team midseason. Little can be found on the reasons why he left, but a message board post from a Lee fan declared that he had “some real issues and was gone from the team before the season was over”. This is where the timeline gets a little hazy. What happened to the guy selected as third-team ALL-DECADE for Illinois High School basketball? Well, Nate eventually headed back to Central Michigan to study communications, presumably on his own dime. According to his twitter and facebook accounts, Nate is still at Central Michigan, although it is unclear if he is still a student. If he is still a student, let’s hope his first real-world job involves tweeting, as he averages nearly 50 tweets a day! Basketball-wise, Nate appears to be playing in pick-up games at the school’s recreation center and is the coach of the Central Michigan “club” basketball team. Once a Boilermaker, always a Boilermaker though: just yesterday, Nate tweeted, “Sprained PCL is wat the trainer say... torn acl n my right knee ... #CantWin”. 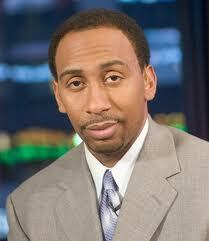 Off the court, Nate has a young son and tweets about him all the time. He’s also gotten into some trouble with the law. Last year he was charged with driving with a suspended license and according to his twitter account, this month he took a “plea deal” for an unspecified court appearance. Nate Minnoy’s career peaked during high school, as college injuries, disciplinary issues, and an oversized ego led to one of the rarest “feats” in basketball – playing for 4 different universities in his 4-year college career. While a basketball future isn’t likely in the cards for Mr. Minnoy, he is still affiliated with Central Michigan and will hopefully be getting his life back on track in the near future. By the way, did you come up with the 4 Freshmen who have most recently averaged double-digit points? The two most recent are Robbie Hummel and E’Twaun Moore (JaJuan Johnson didn’t average double digits in his freshman year). Nate Minnoy was the third and is joined on this list by a teammate from the 2005-2006 season. Stay tuned for a future “Where Are They Now” to find out who it is! 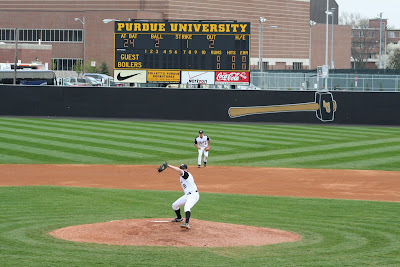 Our first several posts have mainly focused on Purdue basketball and we've even touched a bit on Purdue baseball, but where's the love for the football team? Part of the reason there's not a lot of football news here is that Coach Hope has closed off spring workouts to outside reporters while the Boilers install a new defense. This almost got me in trouble with my boss as I had originally faked tennis elbow surgery for the first weekend of March Madness and was expecting to do live coverage from the football practices during my "recovery". When I returned to work 3 weeks early, I had to explain how they had quoted me the "old" tennis elbow surgery recovery time and that this "new" surgery restored full range of motion within a few days. Where I WILL get in trouble is when I actually need tennis elbow surgery and have to come up with a reason why the recovery time isn't a matter of days after all. Hopefully that will be in March. Anyway, since we can't provide first-hand coverage, make sure to check out today's excellent ESPN.com post regarding the football team's chances next year - it's guaranteed to get you pumped up for the upcoming Spring Game this Saturday! We here at GoBoilers.net have been in meetings for nearly 2 years to determine the perfect time to start our new blog. At the time, there were only a couple of reputable Purdue blogs out there, and we figured we could add some perspective as alumni who watch every single second of every single football and men's basketball game (except for that damn wedding where a distant relative thought it would be fun to tell me the score of the taped Purdue/Oregon game). Over those 2 years, we saw some of the most exciting and aggravating games, and through it all, Kirk and I sent over 100 emails to each other ranting, celebrating, and coming up with statistics to prove to each other why we should still be optimistic about this current team. Don't ask why we didn't just post those here. That would have been a lot easier. We also saw approximately 78 new Purdue blogs pop up over that time. So, the market's saturated, a basketball era just ended, and we've got 5 months until football season - might as well start this sucker up! We're not here to replace any blog that's currently out there - we're here to provide you with an extra post or two per week for you to read on your Kindle Fire when you run out of Purdue stuff to read while taking a dump. We'll be entertaining, we'll be humorous, and we'll use actual statistics to prove our points! We already have some great ideas lined up for the summer, so stay tuned for the premiere of GoBoilers.net!